From USA Today bestselling author Annette Lyon comes a captivating historical novella. In 1905 Shelley, Idaho, Della Stafford hates being a farm girl in a tiny town. She’ll do anything to live in a big city and experience real city life. Her only regret is that leaving town also means leaving Joseph behind, the young man who makes her heart flutter. But she's convinced that moving away is for the best; her dreams and Joseph's dreams are too dissimilar. So Della takes a job as a maid in Los Angeles, where she learns that what she thought would make her happy and what really will are totally different things. 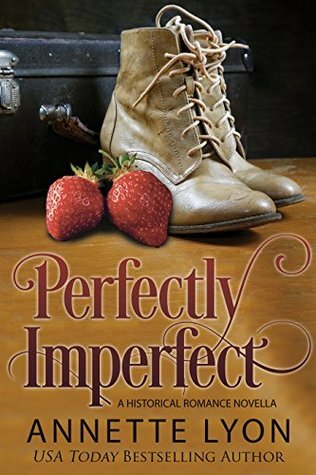 PERFECTLY IMPERFECT originally appeared in the best-selling and award-winning Timeless Romance Anthology series's OLD WEST collection, under the title A SWEETEST TASTE. This is a sweet "grass is always greener" story. Della is convinced that she won't be happy until she's able to leave the small farm town of Shelley, Idaho — she simply must move to the big city. She just isn't cut out for working on the farm and the simple life of small-town Idaho. When she gets the opportunity to move to Los Angeles she almost doesn't think twice. Of course, there's Joseph. He's perfect for Della in every way, except that he is also perfectly content in Shelley, Idaho working the land. Nonetheless, Della moves to LA to experience the big city, where she knows she will finally truly happy. But, as we all know — things always look better from a distance and absence can make the heart grow fonder. This one seems like a feel good book. I like historical fiction, too.